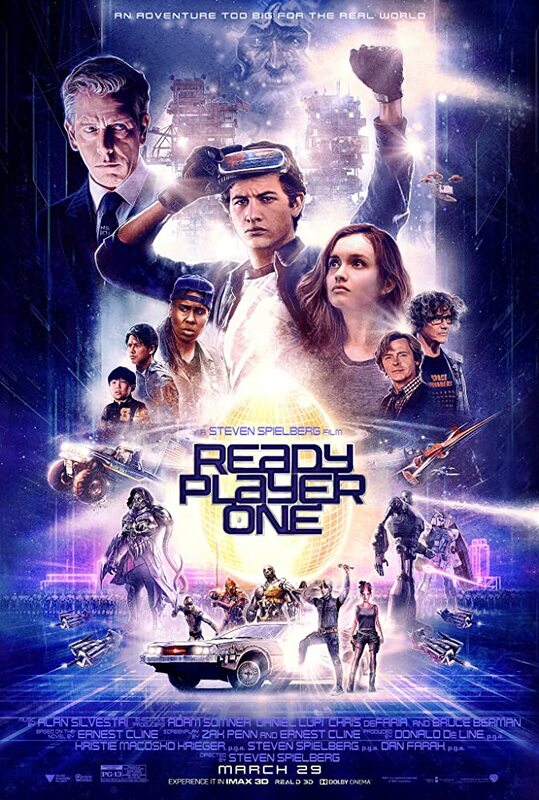 From filmmaker Steven Spielberg comes the science fiction action adventure Ready Player One, based on Ernest Cline’s bestseller of the same name, which has become a worldwide phenomenon. The film is set in 2045, with the world on the brink of chaos and collapse. But the people have found salvation in the OASIS, an expansive virtual reality universe created by the brilliant and eccentric James Halliday (Mark Rylance). When Halliday dies, he leaves his immense fortune to the first person to find a digital Easter egg he has hidden somewhere in the OASIS, sparking a contest that grips the entire world. When an unlikely young hero named Wade Watts (Tye Sheridan) decides to join the contest, he is hurled into a breakneck, reality-bending treasure hunt through a fantastical universe of mystery, discovery and danger. Spielberg directed the film from a screenplay by Zak Penn and Ernest Cline. It seems appropriate that the director responsible for blockbuster movies signed on to direct a film based off a book that oozes pop culture nostalgia. Spielberg has been keeping himself busy as usual but movie fans have been chomping at the bit to see him tackle a blockbuster with the same spectacle as his other films such as Jurassic Park and his Indiana Jones movies. He still makes great films which is evident with Bridge of Spies and The Post but we haven’t seen him deliver a big, action packed thrill in over a decade. Ernest Cline was heavily influenced by Spielberg when he wrote the book so that alone makes the pairing a match made in heaven. What the iconic director brings to this film is the classic family entertainment he’s been known for but with a modern twist. The action scenes are high octane and riveting while he’s able to establish the OASIS as the spectacle it is. The computer generated effects are glossy, maybe too much that it turns the viewer off but it’s worth noting that the OASIS is a virtual reality world and it seems like a suitable portrayal of a video game. At 140 minutes, Ready Player One is full, almost too full. It combines large set pieces, comedic relief, and a ton of heart. What’s missing from the film is a sense of urgency and what the stakes are. The antagonists are never threatening and their motives are underwhelming and typical. The film has a little bit of everything for everyone but it’s hard to find a reason to root for the heroes when they never feel in danger. More development in the real world, especially The Stacks, would help to bolster the intentions of both the protagonist and the antagonist. The actors all do great work though we’re left wanting more from them. With much of the film taking place in the OASIS we don’t have a chance to see the beloved actors enough, instead seeing them through their avatar. Tye Sheridan’s Wade Watts/Parzival isn’t anything memorable but the chemistry between him and Olivia Cooke’s Samantha/Art3mis is innocent and charming. Ben Mendelsohn once again plays a baddie, this time as Sorrento, the CEO of Innovative Online Industries who is trying to get full control of the OASIS. He isn’t given a ton to do but the slimy, natural screen presence of Mendelsohn is enough to keep the viewer interested. Mark Rylance who previously worked with Spielberg on Bridge of Spies and The BFG plays James Halliday, the co-creator of the OASIS who sets up a virtual treasure hunt to give possession of the company to a random player. The Jobs-like character is a timid dreamer who inspires millions to track down the Easter egg. At times the pop culture references are overkill to the point of mind-numbing but Ready Player One promises a fun time at the movies. Spielberg does a great job building the world of the OASIS as theatregoers are able to move to the classic 80’s soundtrack while pointing out all the familiar faces roaming around the virtual world. By the time the films over you’d have gotten your money’s worth though you may be drained from all the references that are splattered against the screen. Ready Player One re-establishes Spielberg as the founding father of the blockbuster movie.